Angela and I recently hosted two very special guests. Angela’s mother Cindy and her grandmother Marjorie visited us for two weeks. It was awesome! They are both very laid back people, and were a pleasure to have around. 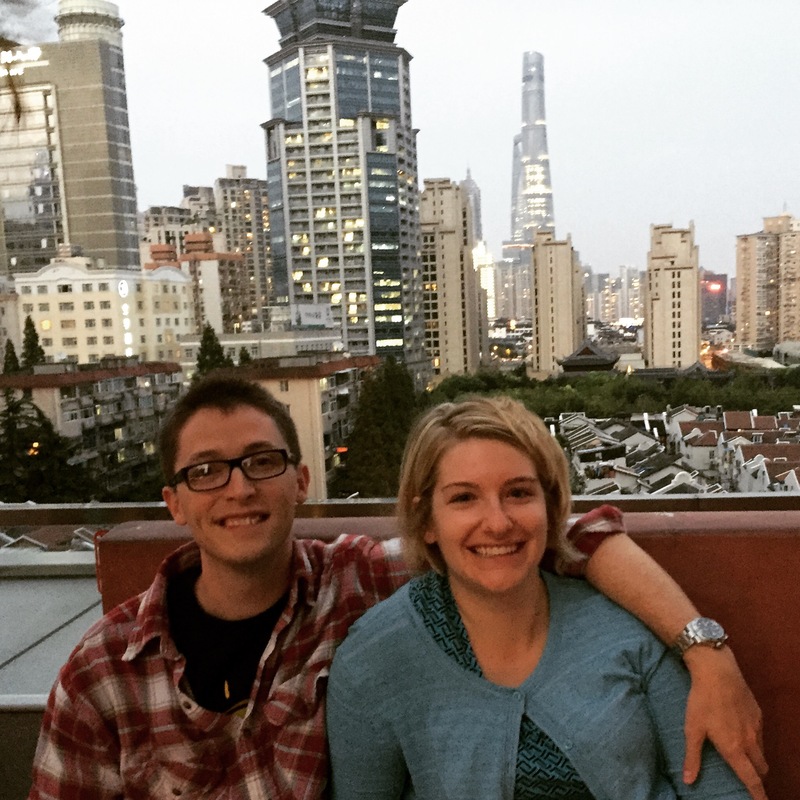 It also gave Angela and I a chance to do a few things that we had not yet accomplished in and around Shanghai. 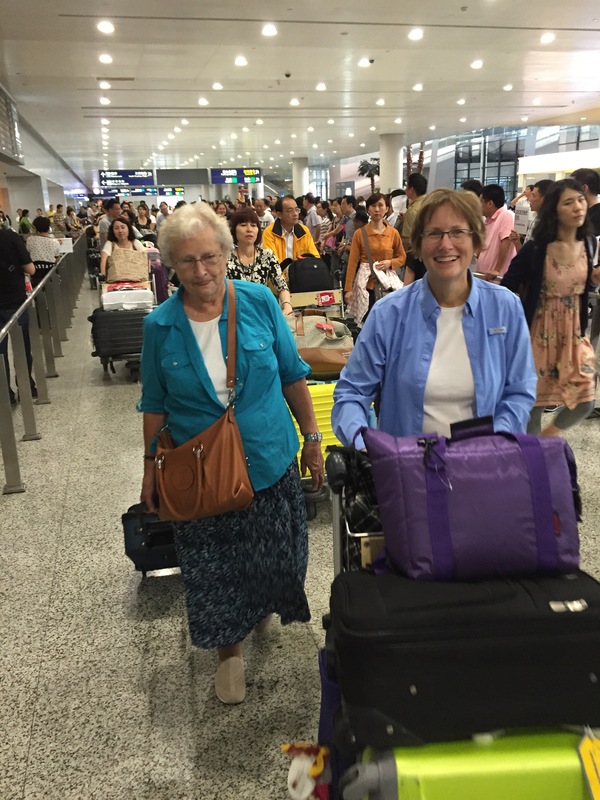 Angela had arranged a driver to pick up her family at the Pudong airport, and she went along. Once they arrived at our apartment, we decided to try to keep them out until 10:00 PM to help them with their jet lag. After getting an in-person tour of our apartment (which took about 35 seconds), we went for dinner at Di Shui Dong. This is a go-to restaurant for us when we have guests. Normally it is a mildly spicey yet still authentic Chinese cuisine, but on this night the chef seemed to be unleashing some inner rage using spices while cooking. At the end of their trip, Cindy and Marjorie still said it was the spiciest place that we ate. I think it was a good way to start, as everything else just got better and better from there. The night was so beautiful that we decided to head to the Bund for a clear view of the river. We settled on the cheapest place we knew, since that part of Shanghai tends to be very ritzy. We went to Captain’s Hostel Bar, which has reasonable drinks and a great view of the skyline. Only Cindy and I wanted to drink, and the waitress informed us that we all had to drink in order to stay. The entire inside of the bar (which is where we sat) was completely empty, but they decided it would be better to have zero drink orders rather than two drink orders. I understood where they were coming from, but still kind of a bummer. We decided to leave and enjoy the river up close. 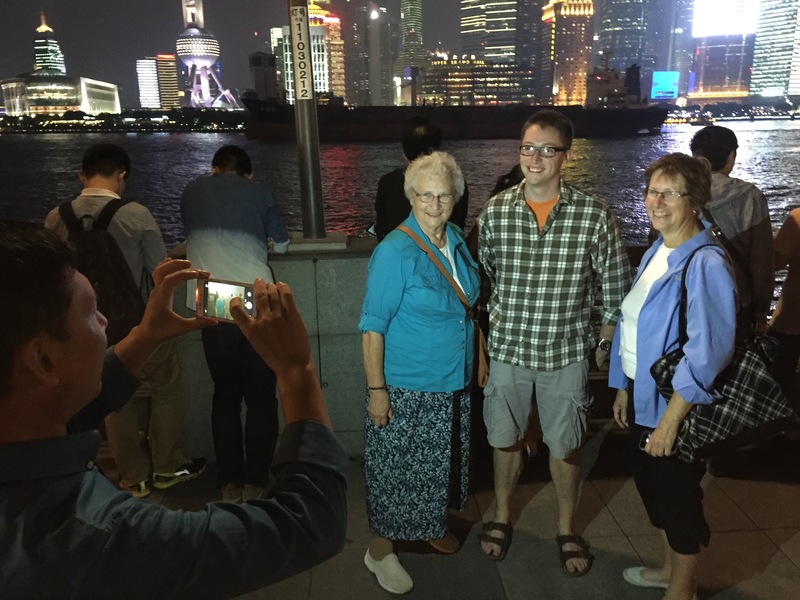 While we were on the riverwalk, we were asked by several different Chinese people to be in their photos. This happens to Angela frequently (tall, blonde, amazonian foreign woman), but only happens to me occasionally. Usually it is during a holiday, when there are Chinese tourists in Shanghai. We were very popular this night! 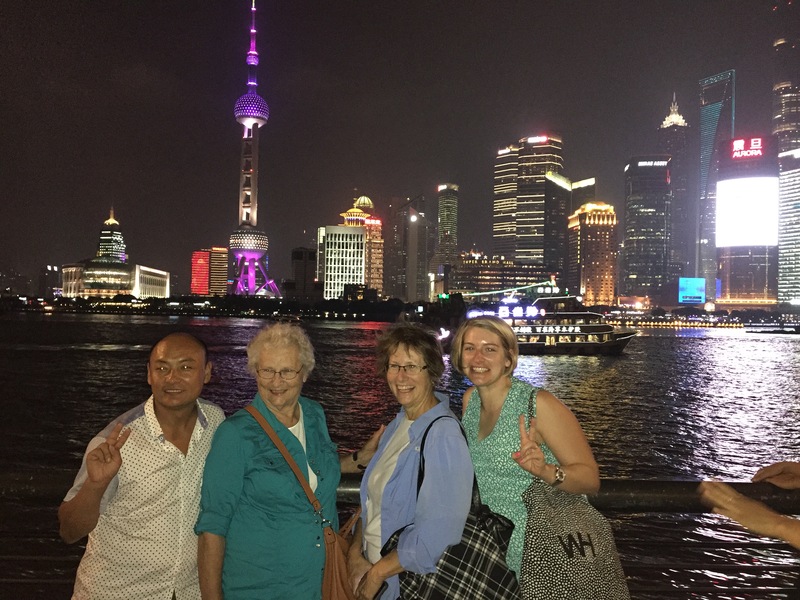 During Cindy and Marjorie’s first weekend in Shanghai, Angela had a masters class to go to. This was really unfortunate for her, but we still had a really great time. I was a little worried about playing tour guide, but had a blast. First we went to Jing’An Temple, which is a very large and ornate Buddhist temple in the heart of one of Shanghai’s financial districts. Cindy and Marjorie move at my pace when it comes to temple gazing, so it was perfect. We enjoyed the sights, sounds and the smells, and then moved on for lunch at Wagas. They were both good sports about wanting to try lots of different foods, but I decided that we needed some western food to keep us all sane, and Wagas is one of my staples for survival. 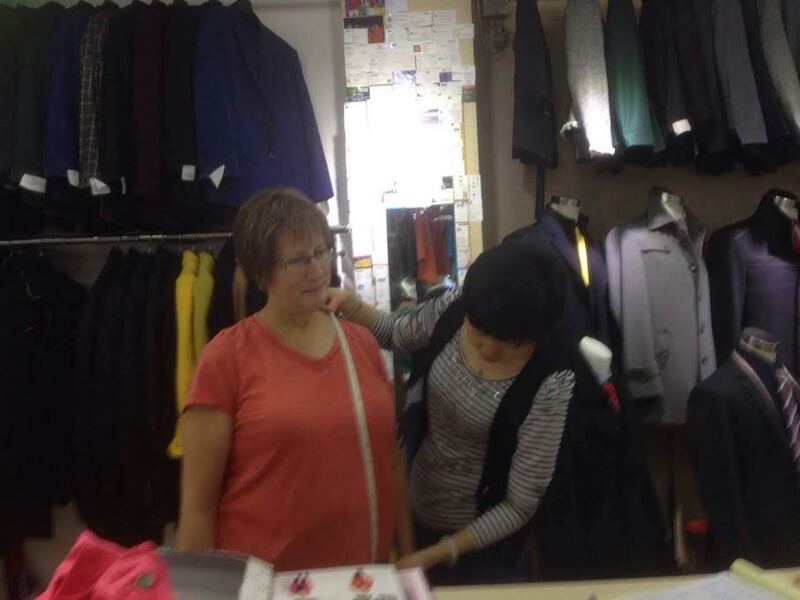 After we had lunch, we went to the International Pearl City to get some clothes made by our favorite tailors, Tony and Helen. The Pearl City is a fake market that specializes in an entire floor of pearls. The bottom floor has many different shops that sell your typical souvenir and knockoff merchandise, and the third floor is the same, with the addition of the tailors. There are many tailors, but I like Tony and Helen the best. They give us a good deal, their clothes always turn out right (mostly), and they are fun to talk to, Helen especially. Her English is very good, and I practiced some of my newly learned Chinese with her. Cindy had two jackets custom made, and Marjorie ended up deciding to pass. 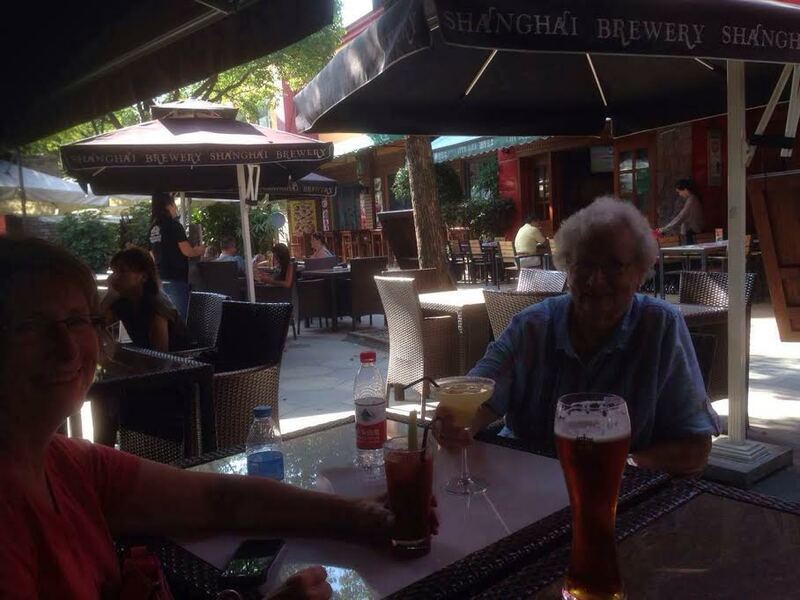 After the tailor, we headed across the street to the ‘Foreigner Street’ for a drink at the Shanghai Brewery and some people watching. 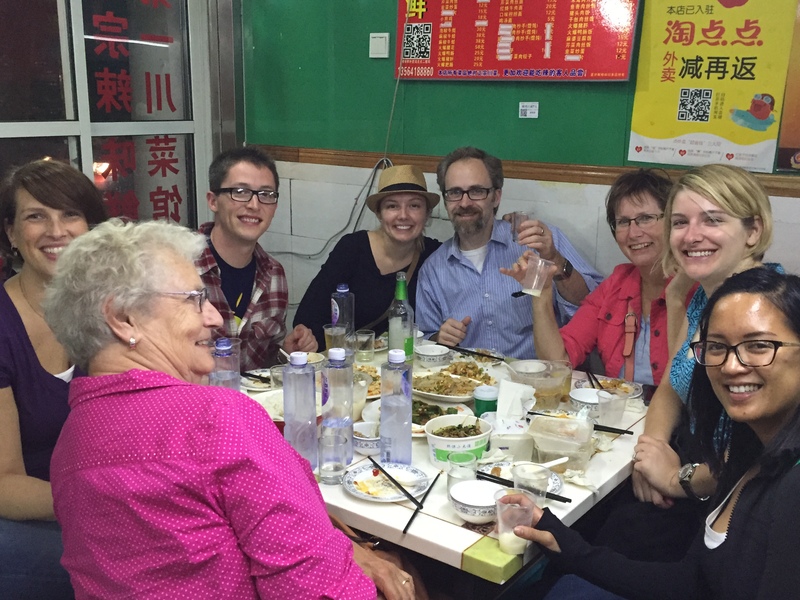 For dinner, we met several of our friends at a cheap Yunnan Chinese place called Lotus Eatery. This is a great family style restaurant that is not very expensive. On Sunday, while Angela was at class once again, the three of us started with Mass at St. Francis Xavier’s Church. Cindy even got to participate in the mass. The lady was hoping that we all would help, but Marjorie and I informed her that we were not Catholic, and so were absolved of all responsibility. After mass, the three of us headed to People’s Park to check out the famous (infamous) marriage market. Angela and I had discovered the marriage market before, which is a venue for desperate parents to try to marry their children off to one another. In their advertisements, they include things such as height, salary, profession and number of apartments owned, while also including their expectations in a spouse (which also include but were not limited to height, salary, profession and apartments owned). I enjoyed seeing Cindy and Marjorie’s reaction to the market as they both thought it was very bizarre and interesting. Cindy took some photos of the actual advertisements, and had some local English speakers translate them for her later. After admiring the marriage market, we had lunch at Barbarossa. This is a fancy looking restaurant in the middle of People’s Park. I was worried that it was going to be really expensive, but it was only medium expensive. 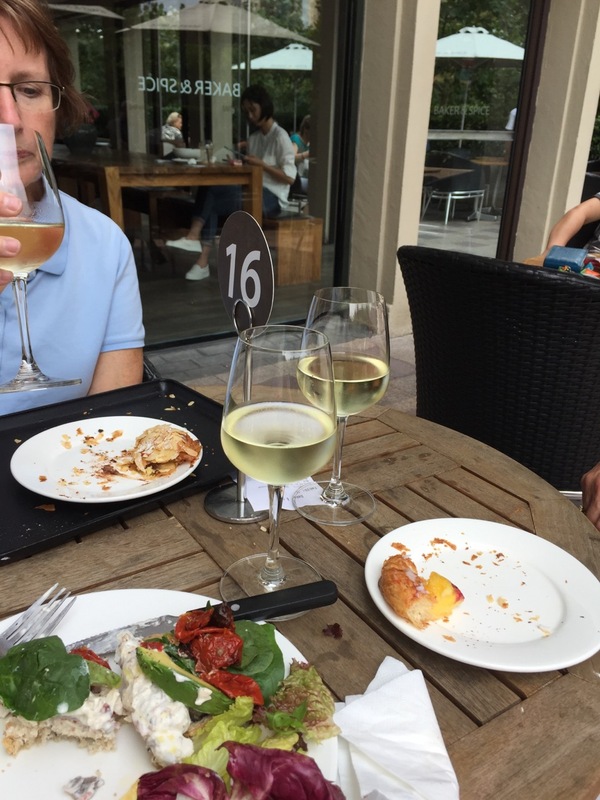 I would highly recommend this place as the food was great, and the view was of the lake in People’s Park – very pleasant. After that, we went for a tour of Old Town, which is the area around Yuyuan Garden. I have developed a deep dislike for the Yuyuan Garden ‘bizarre’ as the more I go, the less cool I find it, and it is always really busy. I had never actually walked around the Old Town that surrounds the crazy garden shopping area, so we did that instead of heading into the gardens. The highlight (for me at least) was visiting the Chenxiangge Nunnery, which is a temple that is in use and a little bit off of the beaten path. On the way back home, Cindy purchased a few sprouts for her hair. Wearing sprouts has become a fashion trend in Shanghai, and now Cindy can fit right in. 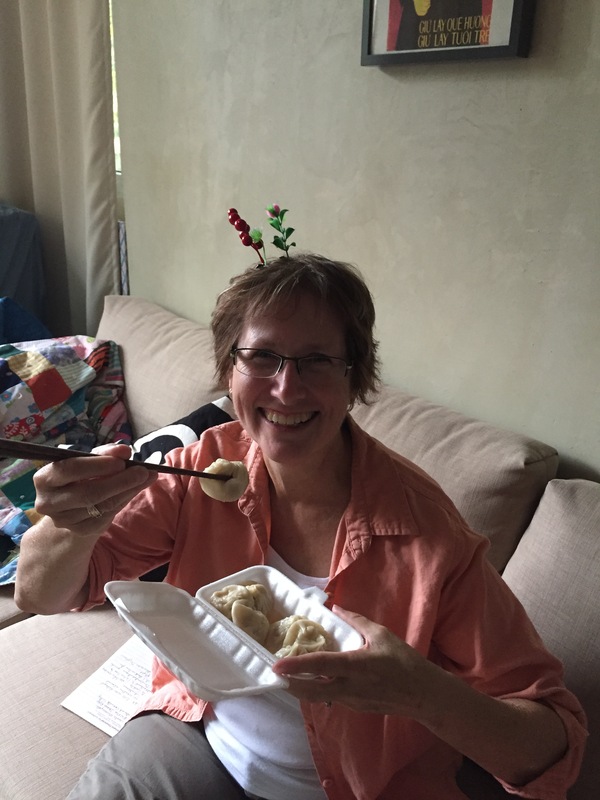 We also picked up some tasty xiaolongbao (soup dumplings) on the way home, so Angela can home to find her mother in full on Shanghainese mode. Angela took her family out the next day while I was at school. Their first stop was the south Bund fabric market, where they admired the different fabrics available. Both ladies are talented seamstresses, and Marjorie is a quilt maker so I think they enjoyed seeing the different fabric options. 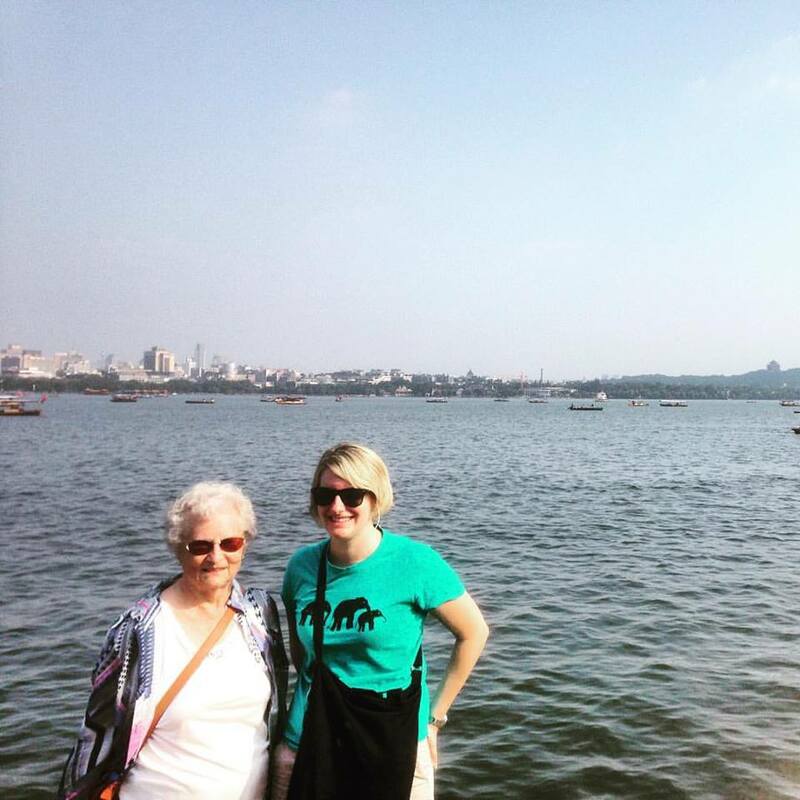 After the fabric market, Angela took her grandmother and mother to walk around the Pudong side of the river, where all of the fancy tall buildings are located. 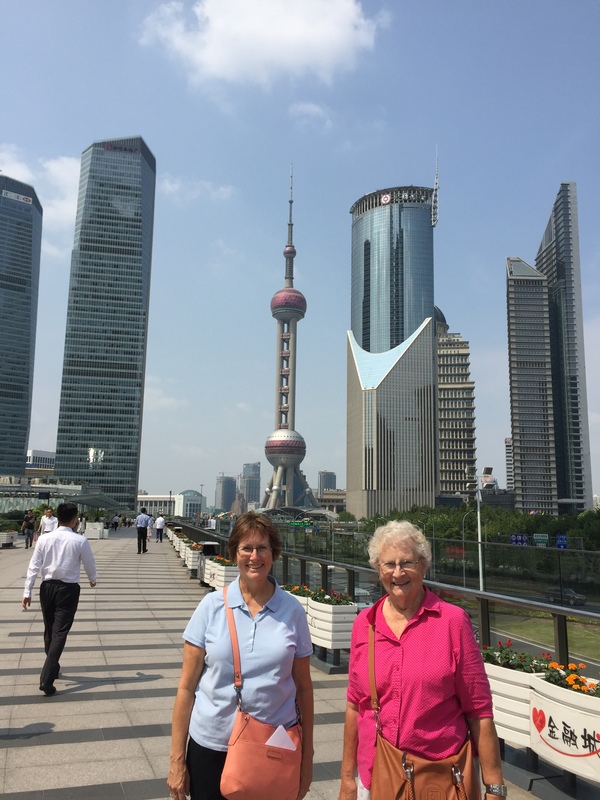 After walking around the Pudong district they headed for lunch. Angela decided to take them on the subway as it is usually easier than trying to get a cab. 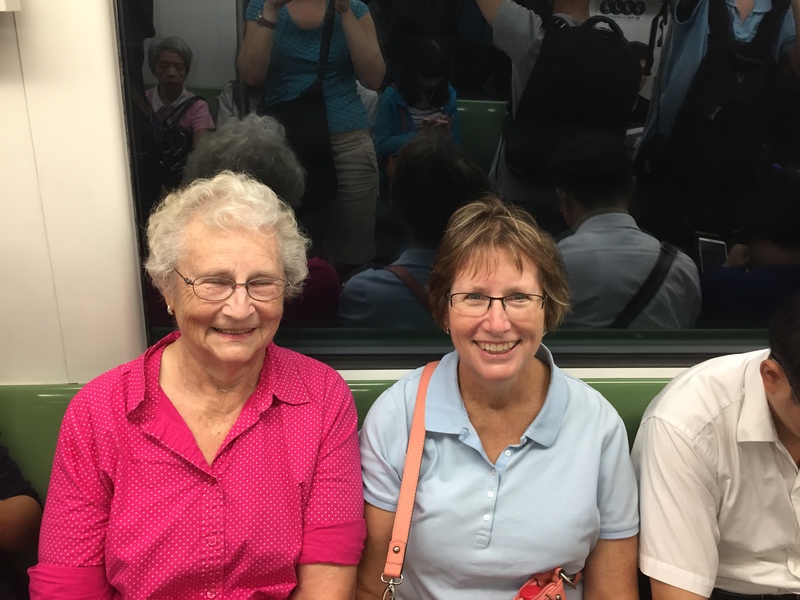 Both Angela and I were worried that people wouldn’t offer her grandma a seat on the metro. However, to our surprise most people did. They stopped for lunch at Baker and Spice in the Shanghai Center before heading to get an afternoon massage. 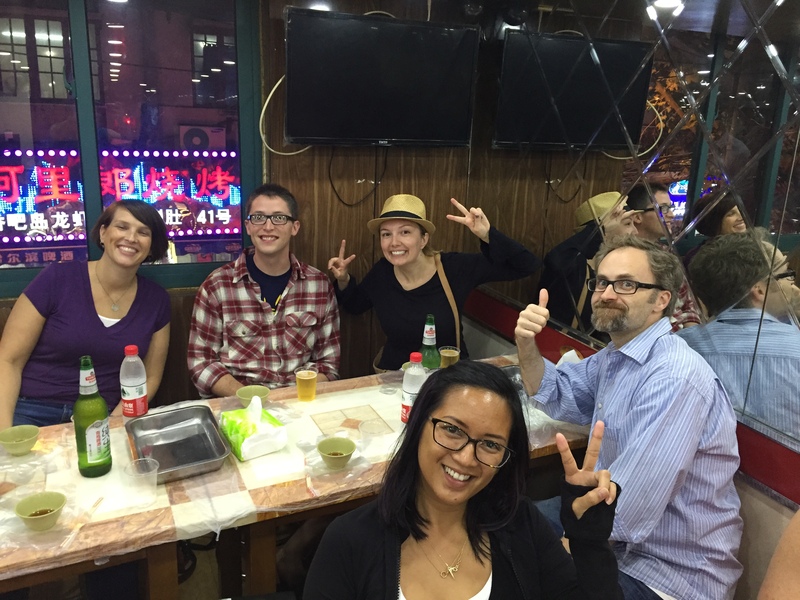 On Monday night, we booked Untour Shanghai’s night market tour with several of our friends. The tour started at 7:00 PM, and it conveniently began near a great Mexican restaurant called Mayita. We knew that Mayita had a great patio so we took advantage of the weather and had a few pre-tour Margaritas. This was our second tour with Untour Shanghai and so we knew that the tour would be enjoyable. Our friends Andrea, Boramy, Sean and Tiffany all signed up as well so we knew the majority of the group. 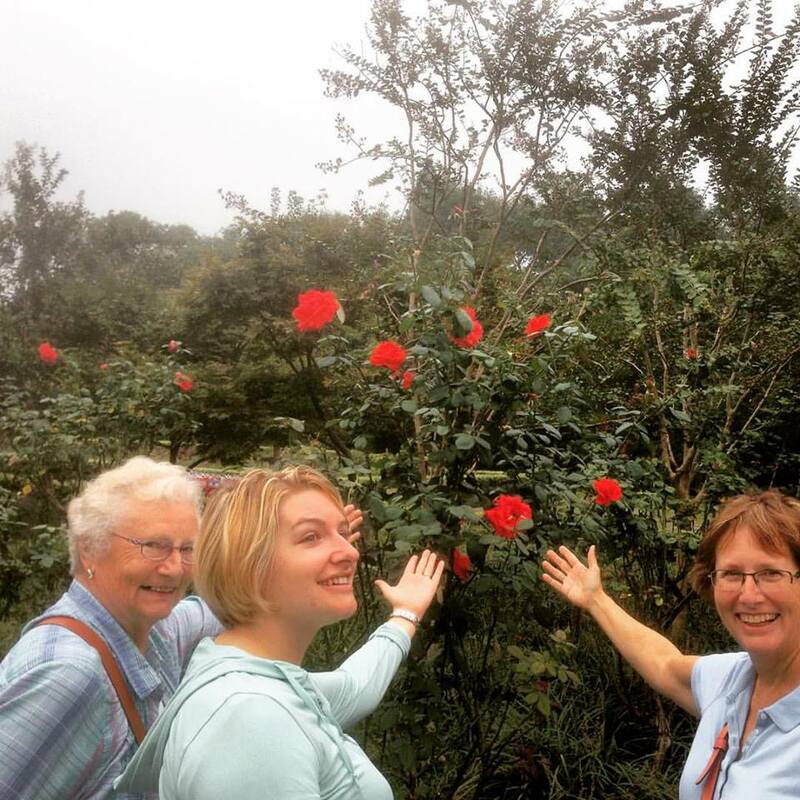 The tour was really awesome and one of the highlights of the two weeks that Cindy and Marjorie were there. At the beginning of the tour, we walked down this really cool food street, and our guide asked if anyone would try snake. Angela looked to me, and I said “sure, I would try it.” He said great, said something in Chinese to a guy on the side of the road, and that guy proceeded to fish out three live snakes from his little bucket. He used a pair of scissors to snip off the snakes’ heads in one pass, and then began cutting the skins off of the snakes. I looked in horror to the vegetarians who were along on the tour, wondering if they were silently blaming me for this travesty. We walked around the rest of the street, and our guide ordered a lot of food that was to be delivered all to one little restaurant so that we did not have to walk around while trying to eat. We sat at tables and ate scallops, craw fish, and an assortment of delicious veggies. At this point they brought up the snake as well, which was friend and battered, and looked suspiciously like KFC chicken. Most everyone tried it and we were all surprised how boney it was, much like a fish. It was delicious! Below is a picture of Cindy finishing off the snake. 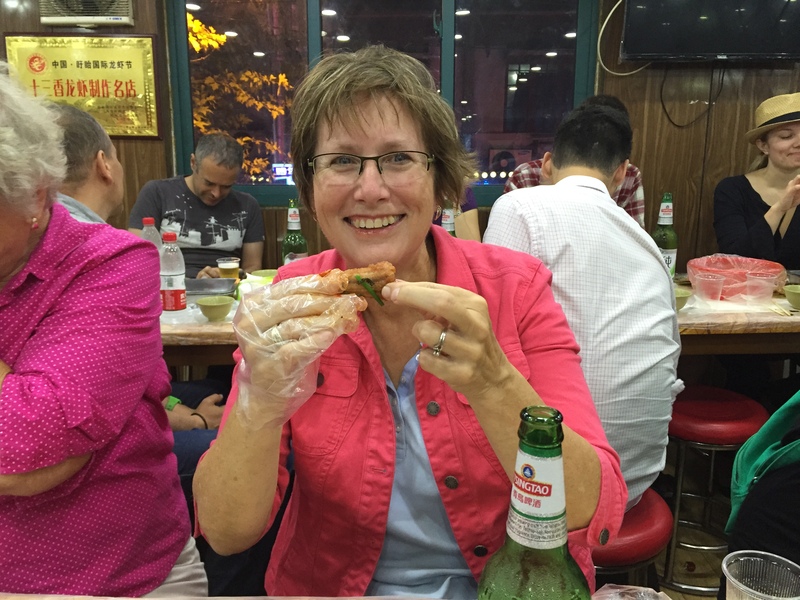 We left the food street and walked a little ways to a traditional Muslim Chinese restaurant. There we tried lamb skewers and dark Chinese beer. 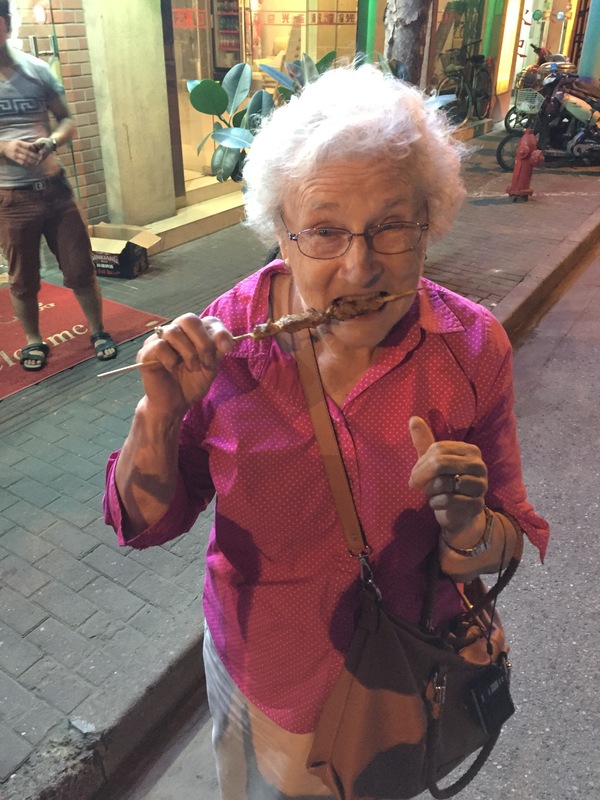 Marjorie was a big fan of the lamb skewers. 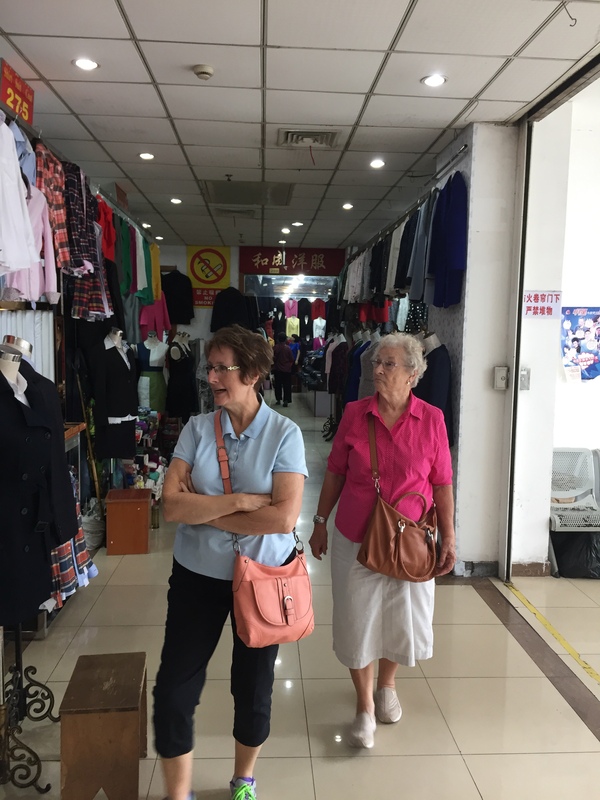 Our last stop on the food tour involved picking up some of our favorite dumplings in Shanghai and then heading to a local Sichuan restaurant to sit and eat. 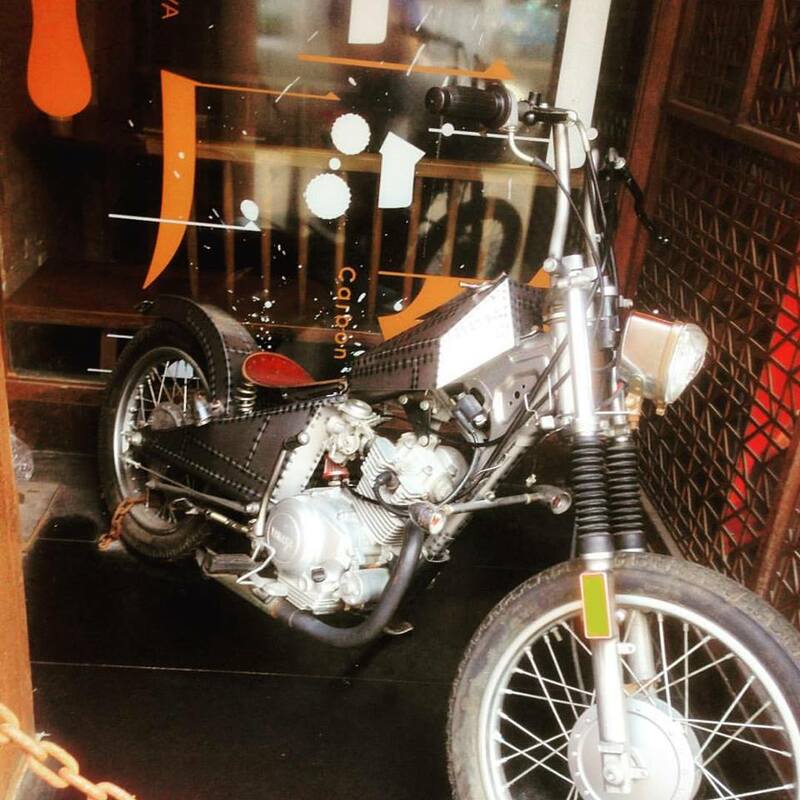 Untour is always a really great time, even for people who live here, because they always show you different parts of the city and hidden food gems. On Wednesday Cindy and Marjorie stayed home and made cinnamon rolls, which were delicious. After work I met up with a few friends and Angela and the ladies went out for dinner with our good friend Boramy at a spicy joint called Sichuan Citizen. They all claimed that it was still less spicy than the first night. On Thursday, Cindy and Marjorie accompanied us to school. Angela had a few projects for them to do and she also wanted them to see where we work. The students kept asking Angela who they were and were excited to show them what they were learning in Angela’s music class. After school, we had our weekly Mandarin lesson, and brought Cindy and Marjorie along. We had told our tutor Nicole the we wanted them to have a lesson and Nicole did a great job, as usual. They learned their numbers, money, and basic Chinese greetings. After our lesson we went to the Dumpling Place (as we call it- neither Angela nor I know what the actual name of the restaurant is) on Guyang road, near our old apartment. On Friday, we officially started our week long October holiday. We all celebrated by visiting Morton’s Steakhouse on the Pudong side of the river. Morton’s in one of my favorite happy hours – especially on the Bund. The drinks, which are normally pushing 100 RMB are only 45 RMB. Now, that is still well over $5 a drink, but they give you all the olives in your martini that you could possibly want. Also, they bring around free steak sandwiches during happy hour, which is the main draw. After Morton’s, we enjoyed the city lights. On Sunday, we took the train to Hangzhou. Hangzhou is only about an hour train ride from Shanghai, and it is well known for it’s beautiful West Lake. First step – we took the subway to the train station on Line 10. We enjoyed the views around the lake after checking into our hotel called the Wyndham Grand Plaza Royale, which I could not recommend highly enough. Prices were not particularly cheap (although they are cheaper than in Decorah, Iowa!) 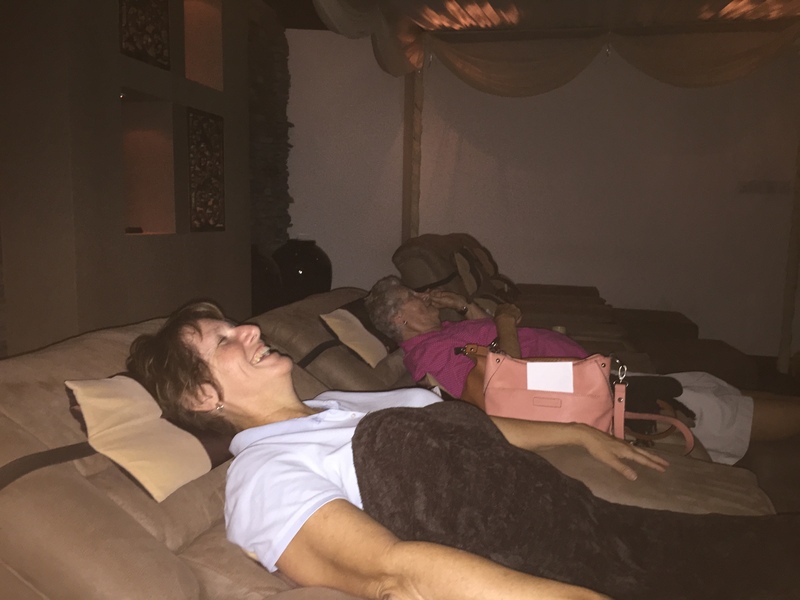 but we received the best treatment. Complimentary tea, departing gifts, moon cakes in our room and a delicious breakfast (the breakfast was not complimentary). It was a great hotel! 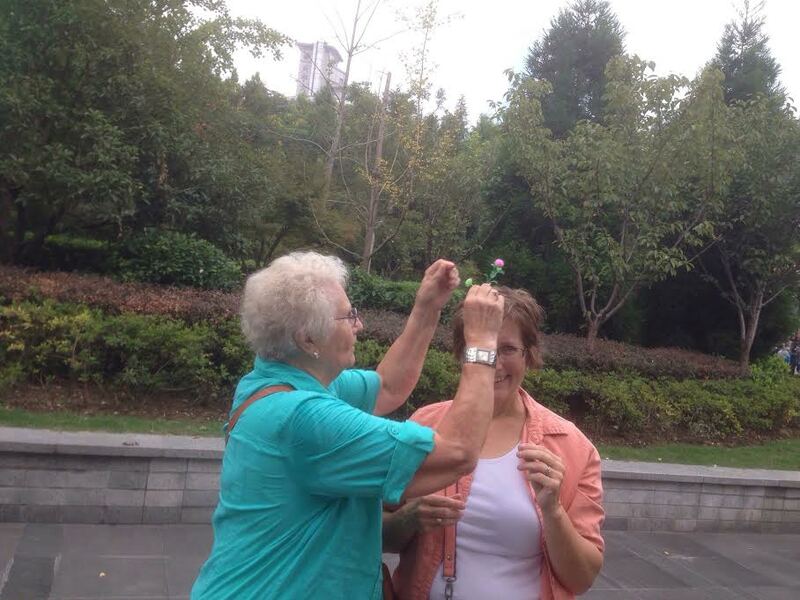 It was the Mid-Autumn Festival in China while we were in Hangzhou, which was apparently a good place to spend it. This means that the moon is full, and people eat moon cakes while admiring the beauty of the moon and contemplating the love story that is connected to the holiday. We participated by enjoying the views around West Lake at night. On Monday, our last day in Hangzhou, we took a boat ride to the Three Pools Mirroring the Moon. These are the interesting statues that appear on the back of the 1 RMB note. We went during the daytime, so I think some of the glamour was lost on us. 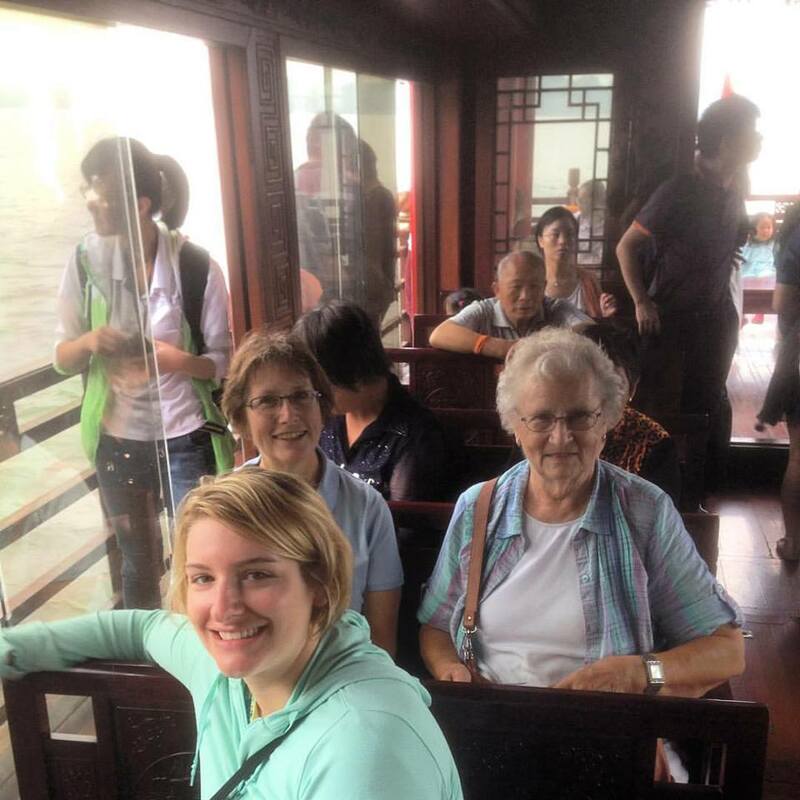 The boat ride was pleasant, and we spent the time trying to communicate with a Chinese woman who had her grandson along with her for the holiday. It was clear that he had some Western features, and she kept pointing us out to him, so we decided to find out the story using our limited Chinese. We did find out that his father was American, so I would call that a success. 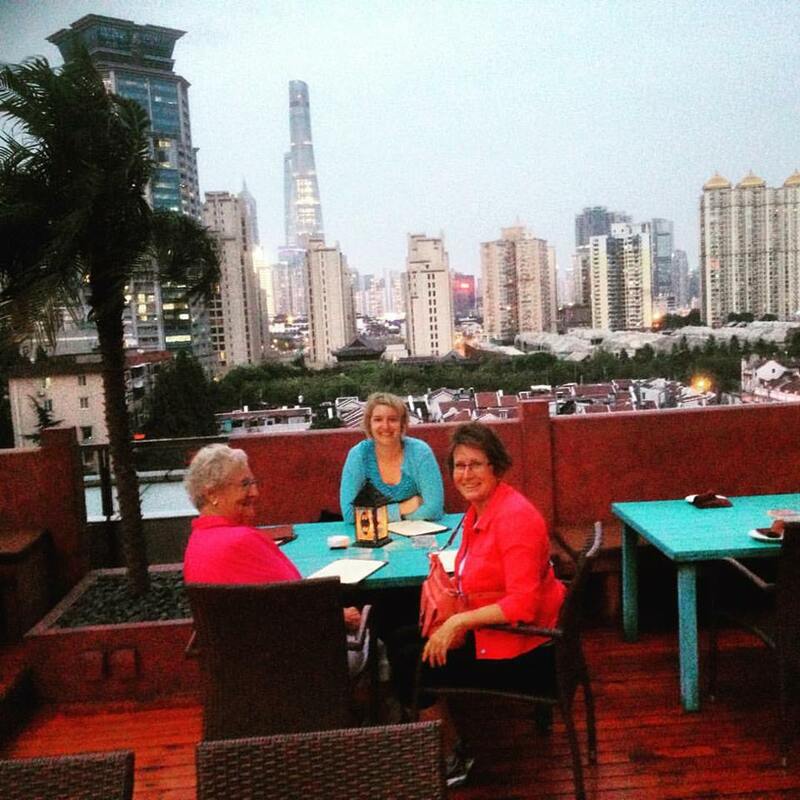 We came back Monday night and relaxed in Shanghai for the remainder of their time. A few highlights were visiting the Propaganda Poster Museum, which I would highly recommend, and taking Cindy and Marjorie to a bar hidden behind a coke machine called Flask. All in all, it was a wonderful holiday and very pleasant to have some family around. Now Angela and I have to go back to talking to only each other again, along with going back to work.